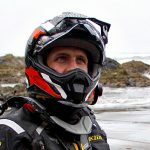 The first time I realized what a difference good riding gear could make, I was frozen stiff to my motorcycle in the thick of a late spring snowstorm. A leather jacket, denim jeans and canvas high-top shoes were the only things that stood between my skin and the unforgiving elements. Up until that point, most of my riding experience consisted of short, fair-weather jaunts. Besides putting myself at risk by not wearing protective equipment, I had seen no other consequences of not having proper riding gear. In that snowstorm, hundreds of miles from home, I quickly learned the virtue of good gear and the positive effect it could have on a ride. Now when I see ominous clouds on the horizon, I make a quick stop to close the vents on my jacket before comfortably traveling on, protected and focused regardless of what the weather has to throw at me. Good riding gear starts with your helmet. A quality lid is the most important piece of gear you wear on any ride. Choosing a helmet is all about finding one that best fits you and your needs. Full-face: This type of helmet offers the most protection and comfort for the rider, cuts down on wind noise and keeps the elements off your face, allowing you to fully focus and appreciate the riding experience. Pinlock visor system: This is essentially a double-paned window for your visor that eliminates fogging. Weight: Avoid heavy helmets and select a lighter helmet made of carbon fiber. Moisture wicking liner: Removable moisture wicking liners are a must for the longevity and livability of a helmet. Venting: Ample venting is important for comfort in warmer temperatures. Good airflow through the helmet prevents humid, tropical-like conditions inside your helmet. Safety ratings: Any road helmet in the United States will be DOT approved but might also feature ECE (Economic Commission for Europe) and or Snell (Snell Memorial Foundation M2010) ratings. DOT and ECE standards are similar, but the Snell standards are above and beyond. A good jacket and pants combination or a one-piece riding suit is paramount to an enjoyable riding experience. Repel water: Water-resistant materials are not the same as waterproof materials. Look for Gore-Tex® fabrics or clothing that uses a similar proprietary technology. Versatility: Choose versatile clothing. A technical shell with good venting can easily be an all-year garment assuming you pair it with the right base layers. Armor/abrasion resistance: Good armor will carry a CE (Certified European) rating that the U.S. has unofficially adopted. Higher quality armor is more pliable and comfortable over long periods of time. Abrasion resistance is a big safety factor, with modern materials like Cordura® and Superfabric® being some of the best available. Get noticed: High-visibility colors aren’t for everybody, but even on dark garments the use of reflective tape is a very helpful safety feature. Cold, cramped feet can put a damper on any ride but, more importantly, your feet need to be protected with a proper set of boots in the event of an accident. Protection: Ankle and toe protection is a must, with bonus points awarded for shin and heel consideration. Water resistance: Most modern waterproof boots have either a “booty”-style liner or an exterior waterproof membrane. The membrane generally allows your feet to breathe better than the “booty” style. Durability: Look at build quality and features like replaceable soles, buckles and hinges. Another usual suspect when talking about discomfort while riding is your hands. The key to keeping your fingers happy while riding are two sets of gloves: one cold weather/waterproof pair and one lighter/breathable pair. Bulk: Compromise on flexibility for warmth. Thicker gloves will generally be warmer, but they can rob you of dexterity. Protection: Look for CE certification and features like knuckle padding, palm sliders and abrasion-resistant materials. Waterproofing: Gore-Tex is king and worth it because of how exposed your fingers are on a motorcycle. The best riding gear is not necessarily the most expensive model or made by the most popular brand. It’s the equipment that fits you and your needs better than the rest. The right gear enables you to ride more often and for longer periods of time, extends your riding season and allows you to ride year-round. Bottom line: being prepared and having the right gear are the differences between a great ride and one that is plagued with discomfort and distraction.